Bertha (Bert) Knuuttila nee Duguay died peacefully on January 24th with her family by her side. Our mother was the heart of the family. Her love for us, her endless patience and joie de vivre were the true blessing bestowed upon all her met her. Bert was a devout member of Corpus Christi Church and the C.W.L when she lived in Thunder Bay. She moved to Jasper in 2011, and she was thrilled every morning when she woke to the beauty of the mountains. 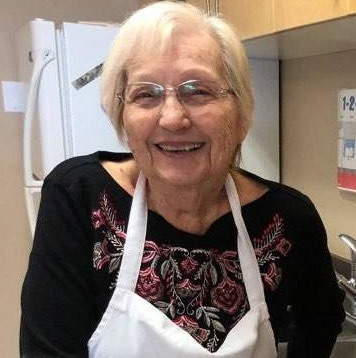 Mom will be lovingly remembered by her two daughters Michele (Paul) Rose of Wallaceburg, ON and Valerie (John) Glaves of Jasper . Alice and Liam Chandler. She was thrilled in her last days, to have an opportunity to meet and visit with her twin great grandchildren. Alfred Duguay of Windsor, ON, Donald Duguay as well as 8 siblings that died as infants. She has three siblings remaining, Gerry Duguay (Sudbury), Teresa Arseneau (Sudbury) and Aurele Duguay of Ste Froy, Que. She had many friends, her best friends being Helen Martin who predeceased her and Helen Isabell and their families, amongst them Rosemary Martin, whom she always considered as her third daughter. Cremation has taken place at Foothills Memorial Chapel. Please sign the online condolences at https://www.foothillsmemorialchapel.com. A Service of Intention will be held at 10:00am on Wednesday, February 20, 2019 at Alpine Summit Seniors Lodge, to be followed by snacks in the lounge.